Geoff arrives today to keep us company and to check that all is OK, you know, man things, like the air in the tyres and if the car is running smoothly, but mostly because he loves us, as much as we love him and a few days won’t be long enough. We’ve had time to adapt to our new environment, but Geoff‘s straight from the city life, he may find it very difficult for just a few days. I was curious if Scott might like to go home with Geoff, as I thought this maybe an opportunity to get back to old habits. He thought for a moment and said “no mum I want to stay with you, I don’t want to miss out on all the fun.” As much as some of this has stressed Scott, he has also embraced the new routine and stated to explore this different life style, even the stricter diet which, unfortunately he reminds me about in every town when we see a bakery. It doesn’t take much to bend the rules a little, as Scott says “that’s OK we’re on holidays and we’re not really that fat “as he looks down and observes his balcony tummy and gives it a pat, then he takes great satisfaction in pointing out I’m looking a little fat. I love the way he says little, not just “you’re fat”. If you’re asking why Geoff didn’t come with us? It’s because it would have defeated the whole purpose of the trip. This is between Scott and myself and if Geoff had have come with us, as much as I would love to share this with him, it would have become a holiday with mum and dad and Scott would have just sat quietly biding his time till he got home. This way we both have to push the boundaries and explore how we cope with each other in a small compact caravan and way out of both our comfort zones. Scott loves his privacy and is often alone for long periods of time in his room playing video games or drawing or looking up Google, who has become a close friend. I drown myself in work, the house and worrying about useless things that I can’t change. I miss Geoff, Adam, Cara and my two beautiful granddaughters and my friends, but that loss is very quickly absorbed when we get up in the morning and plan our adventure for the day. Both of us are embracing the changes and nothing has really fazed us yet, even the quick run to the toilet block first thing in the morning, and we really look forward to a shower that’s bigger than a cupboard, every couple of days at the parks amenities block. I’ve actually learnt to wear clothes that are not perfectly ironed and only wash my hair every few days instead of everyday, funny thing is with this more primitive life style I think I look better and so does Scott. But that may also be due to the fact I don’t have a mirror larger than 6 inches wide by half a metre long that is not in a cupboard that I can just get opened wide enough to see parts of me. I can remember my dad once saying if you don’t look in the mirror, you won’t see the wrinkles, I think he meant in his face not his cloths. Scott looks better because he shaved off his beard. We mucked around all morning and Scott worked on a couple of pieces of art he had started and a little half-hearted detailing. We were both pretty happy to see Geoff, Scott was especially happy as this meant we would go to the pub for lunch. We had a nice lunch at the RSL club (for international readers RSL stands for The Returned and Services League of Australia), most towns have them and they’re usually very good. If they are small RSL’s you get to chat to a few locals, who love to pass the evenings with some support and advice. We took Geoff back to the van and very quickly he found a few things we had missed. More vans had joined us and we were pretty cosy now. Geoff took the opportunity to join up our grey water system, something I didn’t know we had, usually the grey water just runs on the ground or I put a buckle under the outlet. I felt a little bad about our waste, because our new neighbours like to sit outside their van and do some friendly entertaining, having an evening drink and chatting. I don’t think half way through a relaxing beer they would appreciate some body’s grey water gushing out alongside them. This was a good opportunity to introduce ourselves and created some conversation. On this short journey Scott and I have met some wonderful people who are interesting and come from all walks of life. While we were chatting Scott seized the moment, taking advantage to introduce himself, shaking hands with everybody and endorsing their names, and then passed straight through the group. Scott usually just does a brief intro and comes back later for the niceties, when he’s thought the situation through a little more, that may not be till the next day. After a few walks on the Murray River beach edge and a couple of coffees, we settled down for the night. Next day we had breakfast and headed out to see some of Mildura. It’s a beautiful town that’s grown on the edge of the Murray. Lots of these little towns have evolved from early settlers who relied on the water ways to transport goods and trade. Settlements like Mildura were more fortunate when the railway took over from the river boats and has maintained its population and healthy growth. A lot of the smaller communities come in for goods and services as the town is very well equipped with modern shops, super markets and entertainment. When I got to Loxton (across the border in South Australia couple of days later) a gentleman told me lot of people in Renmark and the border towns go into Mildura for their shopping etc. Scott and I had been to Wentworth the day before Geoff arrived, Wentworth is where the Darling River flows down from the north and meets the Murray. The Murray then continues, crossing the border a little higher than Renmark, then weaves its way to Renmark, Loxton and up to Morgan, it then moves south again until it reaches the sea at Lake Alexandrina and out to the Southern Ocean. There’s not a lot around Mildura to visit unless you want to see endless vineyards and fruit trees, so we took him the long trip around to Wentworth Bakery for lunch. We saw a sign to see the Munga Man, this is where the remains of Mungo Man and Mungo Lady were discovered in . These remains are dated at around 42,000 years old. Mungo Man lived on the shores of Mungo Lake when the area was very different and must have supported a wide range of food, water and survival tools. It’s a fascinating part of mans evolution and I would, according to Scott’s rules, visit Mungo Man on Google. Unfortunately it was a dusty road for another hundred kilometres and we didn’t have a lot of time with Geoff, so we turned back. It was well worth the drive along the wide, red dirt roads edged with landscape of orange-red soil, Mallee scrub and farming for as far as the eye can see. 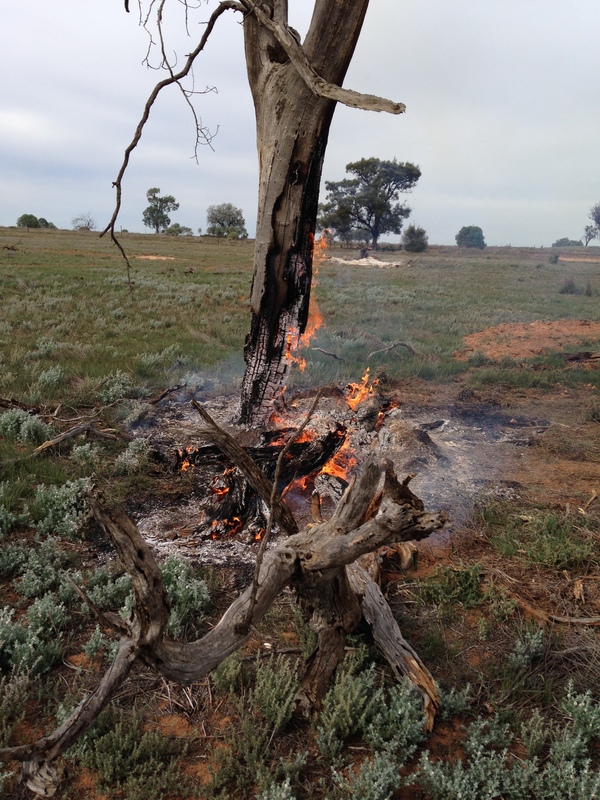 We came across some real tough, Mallee country where they were burning off old wood and dead trees, I took some excellent photos. I didn’t realise I was probably in a very dangerous situation as the photo shows, there wasn’t much left to burn before the tree was about to fall. Later in the afternoon we left Wentworth and headed back to the camp, we found these amazing trees down on the river where one had fallen over the other, so Scott and Geoff went down and sat on the river bank and Scott did a beautiful drawing. For Geoff’s last night we decided to head into town for another pub meal. We ended up at the Grand Hotel, very inviting and we had a nice meal, although there is a little more class than just a pub the tablecloths were white paper, so after dinner Scott decided to pass the time sketching on the tablecloth to the delight of the waitresses. While we were there I noticed a picture on an easel in the corner, it had a style that started me thinking about Scott’s art, earlier in the day Geoff and I were discussing the trip and I said I think Scott has lost the feeling to do his art, I don’t think he is interested any more, later when Geoff left, Scott in his own way confronted me on what I said about him not being an artist anymore and he was very irritated and uncomfortable about it. I said that he’d have to find what he liked to do and not to just try to make me happy, find what makes him happy. I suggested the painting that I had showed him at the hotel could be a style he could work on and make his own, there was very little conversation or feedback, not even an anxiety argument, this often means he was thinking about it. The day Geoff left was pretty interesting as we had to pack up the van and take Geoff to the airport, after we dropped Geoff off we would go back to the Sturt Highway and cross the border into South Australia. I think Geoff would have liked to do the caravan man thing and pack up and load the caravan, but I said that he was not allowed, because Scott’s the man and it’s his job. Before we started I suggested Scott goes for a walk along the river to stretch his legs before we got on the road. Scott was gone for quite a while, Geoff and I started to wonder where he was as he might miss the plane, next thing we hear him chatting away to our lovely neighbours and it was a very good discussion, all the niceties and farewells that campers exchange in the morning chore. Next thing I hear Geoff and the neighbour assisting Scott, I went around and Scott hadn’t gone for a walk, without any prompting he had emptied and cleaned the toilet tank. All done perfectly, the only issue was some difficulty putting the tank back in the van and with my brief interlude all was done. I’m so proud of him showing initiative and doing the job right. We were pretty impressive packing up the van, Geoff stood back patiently and let us do our thing or should I say Scott’s thing, as much as I’m sure he would have loved to have intervened. We got Geoff to the airport in plenty of time and said all our goodbyes until we meet again in Mount Gambia on the 5th of June. Over the border and on to Renmark, Scott reinvents his art techniques and we’re tested on our caravan skills.